Whether you are ordering business cards, letterhead, or event announcements, your choice between flat and raised print makes a big impact on how the final product looks. Is flat print the best choice? Or will thermography shine? These are not your only options for impressive printing, but today you will read about the comparisons between them. What are Thermography and Flat Print? Before we can talk about the different uses for these print processes, we want to introduce you to the way that thermography and flat print work. Flat printing is exactly what it sounds like: print that is flat. Flat printing is the classic combination of ink and paper, creating an image that is level with the surface of the paper. Thermography, also called raised print, is a process that takes flat printing and adds dimension. While the ink is still wet, powder is applied to it. The printed stock is then heated so that this powder “rises” and creates a textured image. This heat also dries the ink quickly. The end result resembles a rubbery finish. Flat print might not rise above the page, it still creates striking final products that rise above the competition. It is the perfect choice for all the projects that require more color and detail. For all designs with bleeds, flat printing is the option to go with. You won’t have to worry about melting or chipping. Flat print allows you to use light and dark colors together, giving a professional look to both your light and heavy coverage printed pieces. One of the biggest benefits to thermography is that it gives a high quality look at a low cost. 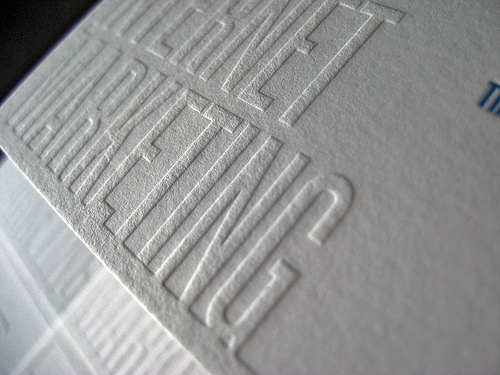 Adding texture and a bit of shine, thermography adds a high quality touch, and also makes colors more vibrant. Because there is less ink coverage on light colors, there is less ink for the thermography powder to stick to. So, the lighter colors will not be raised to the same degree as darker colors, but adds dimension to your finished piece. As you can see, each option has its benefits depending on what sort of job you are working on!